Stock status is current as of 4/18/2019 1:08 PMET. The Solidtek Industrial Keyboard with Touchpad offers an optimum blend of rigidity and flexibility to make your computing life easier. This rugged industrial keyboard is made of silicone and comes waterproof and washable; so you don't have to worry about liquid spills while you're working. Plus, its rubberized surface with touchpad allows for comportable typing and navigating of your contents. 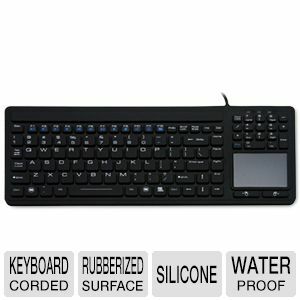 This keyboard also works well with Windows� 7, Vista�, XP, 2000, ME, and 98, enhancing both flexibility and reliability. Grab the Solidtek Industrial Keyboard with Touchpad today!